I was in The Hunstmans Hall back in November with The Brinkster. Well, we figured that if either blogger was beaten up the other could at least write an eye-witness account of it. As it turned out, we were the only ones in the pub that night. The kitchen was closed, Sky TV had been disconnected, the bar was barely stocked with drinks and was not so much being staffed as kept on life support by the bloke who lived above the pub. As the new year begins the cloud of uncertainty hanging over The Hunstmans shows no sign of lifting. It is pot luck these days as to whether the pub will even be open. The word on the street is that new tenants were lined up to take over the running of the pub at the end of last year but the deal hit something of a stumbling block. Those living in the pub's accommodation have been asked to move out and Worcester Park's oldest drinking establishment continues to struggle by. Just when it had seemed that The Hunstmans was beginning to shake off its troubled past and reinvent itself, things appear to be going horribly wrong. 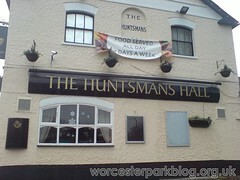 For the sake of Worcester Park, I hope that the town's oldest boozer emerges intact eventually.